AirPura UV600W (UV600-W) Pathogen Control Central Air Purifier employs High-output Germicidal UV Bulb for Superior airborne pathogen and antigen control in a whole house up to 2000 sq. ft.
AirPura UV600W (UV600-W) Pathogen Control Central Air Purifier features High-output Germicidal UV Bulb that delivers a Superior sterilization power of UV light for airborne pathogen control. At the same time the AirPura UV600W True HEPA and Activated carbon air filtration system renders a premium air cleaning power in removal of all microscopic allergens, dust, chemicals and odors in the whole house through the air duct of a house's central ventilation and air conditioning system (HVAC). AirPura UV600W Pathogen Control Central air purifier is an equivalent of the AirPura UV600 portable air purifier for airborne pathogen control. It employs similar size and efficiency True HEPA and activated carbon air filtration system along with High-output Germicidal UV bulb. However, unlike the portable air purifier, the AirPura UV600W Central air purifier is connected to the air duct of a central home HVAC (ventilation and air conditioning system / furnace), and therefore purifies the air distributed throughout the entire house. When to Use AirPura UV600W Air Purifier? AirPura UV600W central air purifier is the best model when you need to maintain pathogen-free (microbes, bacteria, germs) indoor environment along with the effective removal of all common allergens, dust, all regular chemicals and noxious odors in houses up to 2000 sq. ft.
As a standard equipment AirPura UV600W central air purifier employs the High-Output Germicidal UV Bulb. The Germicidal UV light provides the most speedy and effective sterilization of the air from all airborne pathogens. The sterilization power of the Germicidal UV light is 1,600 times of a direct sunlight, and therefore is extremely lethal to airborne pathogens: viruses, bacteria, microbes, germs fungi, etc. The UV bulb has a separate On/Off switch with indicator light, which allows to operate the UV bulb independently. 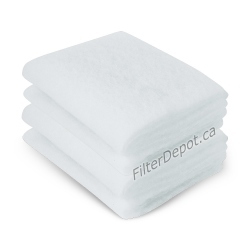 True HEPA filter traps from the air over 99.97% of all microscopic airborne contaminants down to 0.3 micron in size to provide a superior level of protection from lung damaging dust, allergens, cigarette smoke, etc. The chemical and odor filter contains massive amount (18 lbs.) of regular activated carbon adsorbent in a separate filter canister. Such a large amount of adsorbent guarantees the fast and effective removal from the air of all regular chemicals and noxious odors such as: cuisine odors, pet odors, chemicals in cigarette smoke, smoke from wood burning stove. household chemicals, and many more. 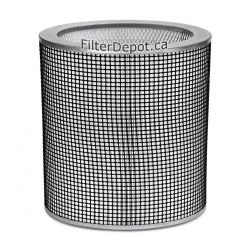 The AirPura UV600W air purifier filter canister contains Coconut shell as a standard activated carbon adsorbent, which is the most widely used type of activated granular carbon in majority of high performance air purifiers. The alternative Anthracite based activated granular carbon adsorbent is available at No Extra cost if the light sweet smell of Coconut shell carbon becomes an issue for some users. The Polyester based Pre-filter is the the first stage of the air filtration system of AirPura UV600W central air purifier. 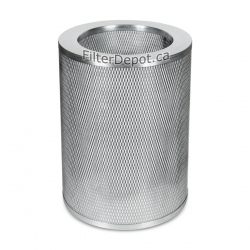 The pre-filter traps most of the larger visible dust and dirt particles to protect fine True HEPA filter from faster contamination and extend its lifetime. AirPura UV600W Powerful Energy Efficient Motor Fan Assembly. AirPura UV600W employs powerful, yet energy efficient Motor/Fan unit with a variable speed control rated at 560 CFM - the same one used in AirPura portable air purifiers. The variable speed control allows the users to adjust the air filtration rate by selecting the speed setting that is the most suitable for any particular air cleaning application. The One-piece Motor/Fan assembly is factory balanced to ensure the vibration and noise-free operation. 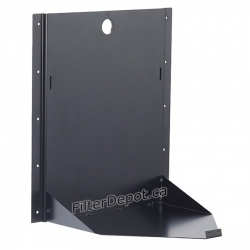 The compact design of a motor / fan unit leaves more room for placement of larger filters. 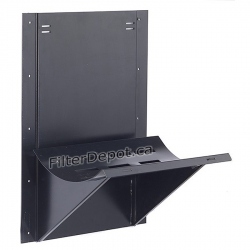 The motor and electric components are placed in a separate chamber to eliminate the contact with the already filtered air passed the filter thus prevent its re-contamination. The Standard configuration of the unit is for North American power supply standard of 120V, 60Hz - (Canada, USA, Mexico). AirPura UV600W Air Purifier Durable All Metal Housing. As all central air purifiers, AirPura UV600W features durable, impact resistant the all metal enclosed housing. Available in a single color - Black. To ensure simple connection to the air duct, the AirPura UV600W central air purifier is equipped with standard 5-inch hose attachment for both Polluted air intake (top panel of the unit) and Clean air outlet (bottom of the unit on its side). To ensure an easy mobility for the units used to remove the polluted air at a source, it can be equipped with 4-Wheel casters on the bottom panel at no Extra Cost. AirPura UV600W Air Purifier Manufacturer's Warranty. AirPura UV600W air purifier comes with the most comprehensive limited manufacturer's warranty in air purifier industry. It gives the AirPura air purifier owners a Peace of mind. 5-Year Full Warranty on Parts and Labor. 5-Year additional warranty on Labor (the more expensive part of the total repair cost). The Total duration of the Limited Manufacturer's Warranty - 10 Years. If used as a central air purifier, AirPura UV600W requires connection (hook-up) to the furnace's (HVAC) air duct using the 5" diameter flexible or rigid hose. The AirPura UV600W whole house air purifier can be installed Free standing or using the optional Wall brackets. AirPura UV600W air purifiers ship free of charge by FedEx Ground delivery service in Canada and the Continental USA. Diameter 15" (38 cm) Diam.